This is the same basic recipe I used when the kids were growing up, altho it’s evolved through the years. I will note where you can substitute ingredients (and you can of course). In addition you can multiply the recipe to freeze. When I was making this for a family I ALWAYS made an extra to freeze. I think it’s actually better after it’s reheated. Old El Paso Enchilada Sauce (it comes in hot or mild or medium –when the kids were little I used mild, choose whichever works for you). You can also substitute here. IF you make your own sauce WOW good on you! I’ve made red chili sauce and it’s wonderful but I don’t usually have home made around. 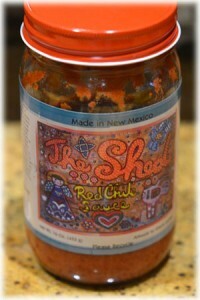 I also have a small stockpile of sauce from The Shed (a wonderful Santa Fe restaurant, go there if you get a chance, you will NOT be sorry!) and that’s what I used this time (it does contain wheat! )–you CAN order it online and yes, it’s better. But I never used it when the kids were growing up because I didn’t know it was available, or maybe it wasn’t. Heat oven to 350 F. Brown ground beef and drain well. (I always drain mine in a big stainless bowl lined with paper towels). While the meat is cooking dice the onion (not too fine) and set aside. If your cheese is not already grated (I like to buy it in blocks and grate it myself, I think it stays fresher) do that also –it will take the whole thing. Heat the enchilada sauce in a sauce pan until hot. DO NOT LET IT BURN! *If you are using a thick red sauce like the wonderful stuff from The Shed you will have to thin it down, about half and half with water. When the meat is drained, add the taco sauce, the onion and the green chili. In a 9×9 pan put enough red sauce in to cover the bottom. Then layer corn tortillas in. I tear some of them so I don’t have big gaps, but it doesn’t really matter. Drizzle some red sauce on the tortillas for good measure. 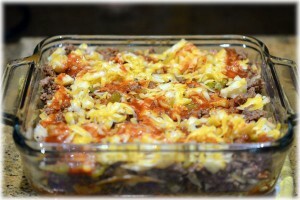 Then put a layer of the ground beef mixture on top of the tortillas and a sprinkle a layer of grated cheese on that. 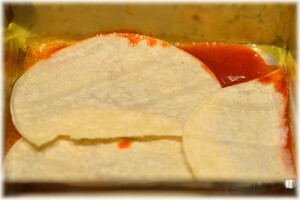 Drizzle some red sauce on it and add another layer of tortillas. Depending on your pan and how much “stuff” you have you will get 2 or 3 layers. This is one of those recipes I usually am pretty approximate about. I just keep going until I’m out of stuff. If you have a large family, make a 9 x 13 size pan (double the amounts –altho don’t open the second can of enchilada sauce unless you run out of the first, you may not need it–and you can put the sauce into a ziploc and freeze the leftover so you don’t waste it). It’s also a good recipe to make smaller dishes of (I just found some pyrex pans that are about 7 x 5 I think) if you live alone or even for couples. This stuff freezes nicely as long as it is in something sealed. 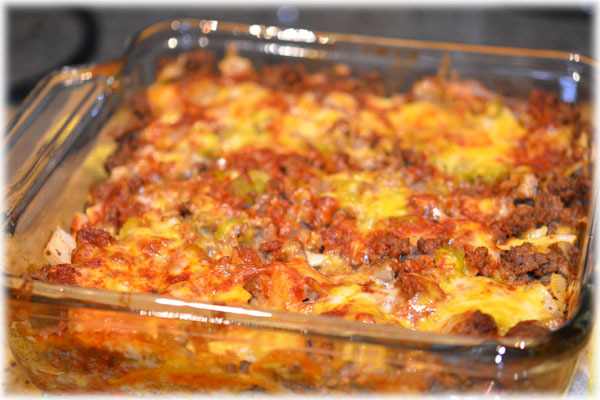 The last layer should be cheese and then drizzle with more enchilada sauce. If you’re too skimpy with that it will be dry but don’t overdo or it will be soupy. (remember, DRIZZLE, don’t POUR) I used about 1 1/2 cups of sauce. Not rocket science, there’s leeway. Then pop it into the oven for about 20 to 25 minutes. The top should be beautiful melted cheese. I like to take it out and let it set for a few minutes before serving. Wonderful served with a side salad, but I like it best with a dollop of sour cream on top and served with half an avocado sliced up with a squirt of lemon. Heaven! I always make enough to feeze, it’s even better as leftovers.